Our class has been working to develop ideas about what they are reading to write a one page written essay. Readers read the passage two times. The first time is to get an idea about what the text is about and what the author is trying to tell us. The second time is to underline important information (key ideas), to circle challenging and confusing words, to write any questions, and to write your thinking (annotate). Students have been writing responses based on one text AND responses based on two texts that are related (paired texts). Below are the steps students take to answer a paired text question, and the success criteria for the written essay. Analyze the question. What is it asking? Look at the first text and my annotations. Find clues to answer the question. Look at the second text and my annotations. Find clues to answer the question. Develop a central idea. This is the center of the writing. Answer the question using evidence from the texts. Use your box and bullets organizer (see below) to plan your response. Then write your response. I answered all parts of the question. I stated my central idea at the beginning of the essay. I gave evidence from the text or texts. I wrote a conclusion sentence (so what). Students share their essays. They offer positive feedback and suggestions to improve writing based on the success criteria. After students are finished with the essay they use a checklist to critique their writing. This checklist allows them to analyze their writing for the central idea, evidence, explanation, and conclusion. Perhaps the most important component is identifying what they need to work on so that they can continue to improve their writing. Below you can see students hard at work. They are reading essays and evaluating the essays based on the “Writing about Reading Checklist”. The entire class has made significant progress and we will continue to work on writing about texts. Please encourage your child to use the CUBES strategy on any math homework involving word problems. This Perimeter Area Song was fun to sing along with! I hope everyone had a safe, restful, and enjoyable April vacation. Now that we’re back, it’s time to focus on math. We will be spending the next two weeks reviewing math concepts for our Math MCAS on May 12 and May 13. 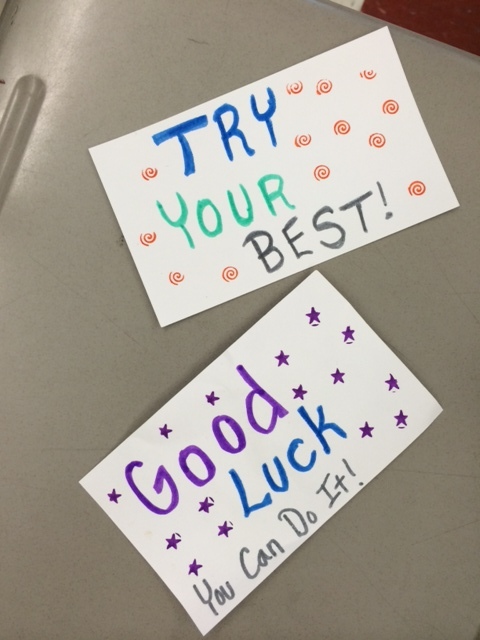 Students have learned all math topics for the test and they have been working very hard in class. They know how important it is to show ALL work, to write equations, and to write a sentence with the answer for open response questions. Students have also learned a strategy called CUBES to help them solve word problems. CIRCLE the numbers, UNDERLINE the question, BOX in the key words, EVALUATE and draw, SOLVE and check. 1. Review math morning work problems with your child. You will find a daily worksheet in your child’s yellow homework folder. 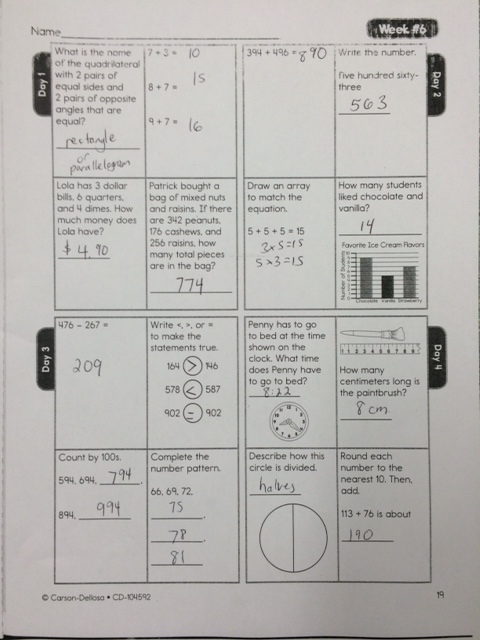 2. Review math practice MCAS questions with your child. 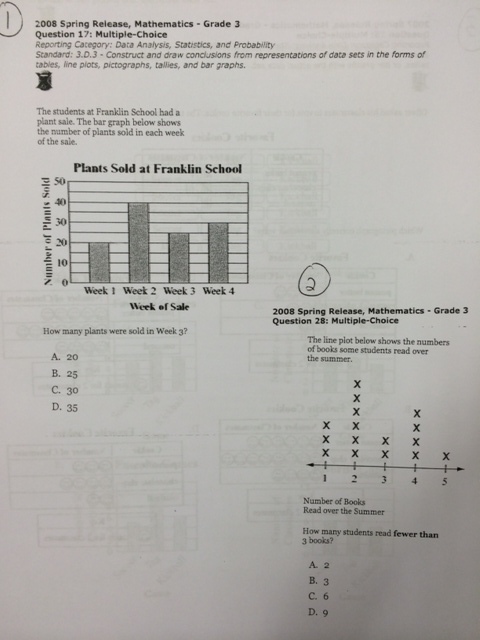 Today we reviewed data–line plots, tallies, bar graphs, and pictographs. These questions can also be found in the homework folder. 3. Review any concepts that confuse your child or that your child requires extra practice on. 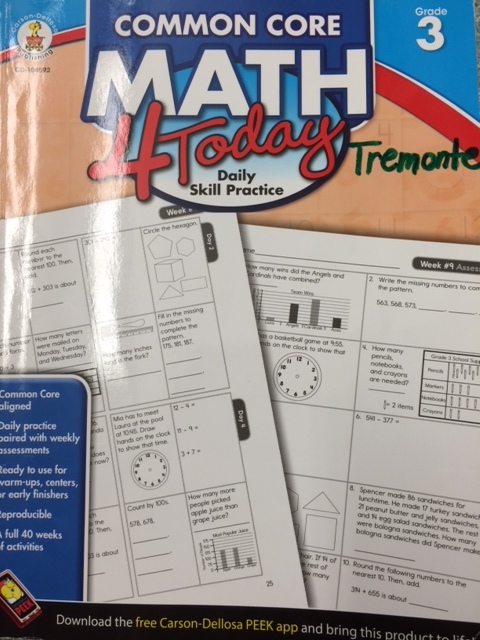 Our math morning work activities come from this book, Common Core Math 4 Today (Carson-Dellosa Publishing). The morning work from Monday, April 27th. Your child should show ALL work! This is the answer key. This is the MCAS practice packet that reviews DATA. Thank you for supporting our students at home! By working together each child can achieve success! Students in grade 3 have been learning many test-taking strategies. Over the last few weeks you have probably noticed many MCAS practice selections coming home in your child’s yellow homework folder. Please review these selections with your child. Ask your child to tell you about the different strategies he or she has been learning about and practicing in school. We have also been trying out a new writing technique for open response questions called Writing With Color. Click here to learn more about it. Here are some seventh grade writing samples to show you how it’s used. Our students will be taking the Reading MCAS on March 31 and April 1.